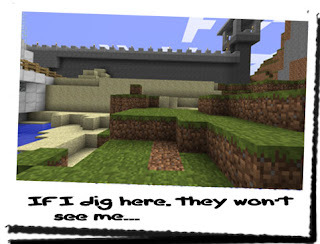 Diary of a Miner: I finally had a plan... Was it all for nothing? I took a shovel, and a pickaxe from the equipment chest in the supply room, strapping them to my back, and hooked a sword through a belt loop. It was going to weigh me down, but it was better than going in defenceless. I took a few torches as well, seeing as though it was going to be a dark tunnel. I went up to the upper level, and onto the navigation deck to see where the guards were posted; there weren't any outside the gate this time, however one was posted in South-West tower. He was going to be an issue, but if I could time it right, then it'd make it easier if I didn't have to go swimming! I went round to the front of the ship, and leaned around the corner to see what direction the guard was looking in. He seemed to be looking out to the West, so I took the opportunity, and jumped the railing on the edge of the front end. I hid under the lip of the wall, just behind the large sand mound. The next bit was going to take a bit of skill. I would need to get into a position where I could see the house enough to estimate where to dig, but not too much so I was exposed... I peered around and up towards the tower, noticing the guard still looking to the West, and I bolted to edge of the land on the opposite side of the ship. So far, so good. I turned to look North, and from where I stood, I could just about see the top of the house... That meant the shaft would be a bit further to the East. Walking East, I took care not to move out of the cover of the ship. About... Here, would do it! I took the shovel from my back and began digging. I don't know about the noise to anyone else, but to me it sounded loud enough to be TNT going off! Every scrape of the shovel entering the earth put me on edge! Eventually I got to a few feet underground, and felt safer, knowing the dirt above me would trap a lot of the sound. After I had dug out a sizable hole, I went back to the entrance, and blocked it up so that I was encased in dirt! This would add excellent protection from escaping sound! I lit a torch, and placed it onto the ground a few paces back and continued digging until I hit rock. I put the shovel away, and changed to using the pickaxe, more conscious of the noise, now more than ever. After a few metres, I began to dig down a bit steeper to ensure I didn't accidentally cause my farm to collapse into the tunnel. Aside from causing a huge distraction, I'd more than likely drown as well! Also, the closer I was to the surface, the more noise the guards would hear... If there were any guards on the inside of the wall. After half an hour of hacking at stone, I pierced a hole in the final part of the wall and stopped dead! Light from the torches streaked through the hole... I had hit more or less on target! Before continuing, I waited... 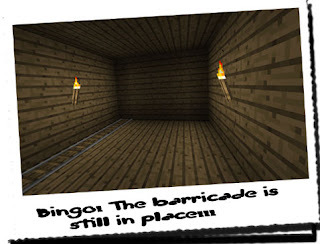 If the barricade had been removed, a guard could be anywhere along the mineshaft! If I made noise when too close to one, they would know something is up and come investigating... I waited approximately five minutes, but there was no sign of any life at all. I continued digging, but I tried to be quieter... After awhile, I had made a large enough hole to get through. Leave the shovel and pickaxe behind in the tunnel, I used a bit of spare cobble to block the entrance... No-one would find that! As I emerged into the mineshaft, I took a few moments to acclimatise myself with the area... 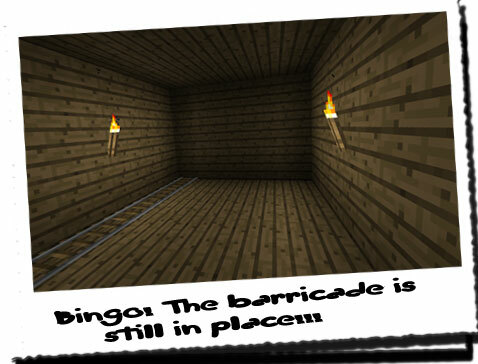 I was surprised; I had hit the mineshaft practically near the start! Remembering the path of the tunnels, I ascended a familiar wooden set of stairs, and found the minetrack I had laid out ages ago! Following the track, sure enough it ended at a wooden barricade, still intact. Brilliant! I wanted to get through this in a way that didn't leave it open, and therefore suggestible that someone had got through. After a few moments of examining the barricade, I found a sufficiently loose enough section of boards which I began to rip out. After there was a big enough hole, I waited, just in case someone was on the other side of the barricade. After waiting a sufficient amount of time, I stepped through, and replaced the boards. That was another stage down. Now, just to get into the house! I began following the passageway that lead North up a long set of thin steps. At its peak, it branched off to go back the way it came, but to the surface instead whilst the other path continued North. Going to the house through the basement would be the quickest route, but as I got to the top of the steps, I saw a shadow appear near the base of the coiled staircase that led up to the basement! Thinking quickly, I retreated down the steps, this time taking a left turn to go up the stairs to the surface entrance! Before going through the door, I took a quick look to make sure no-one was there. I carefully opened it anyway and stepped outside and instantly heard voices! I looked to my right and saw a few guards standing around near the gate, and one against a wall! 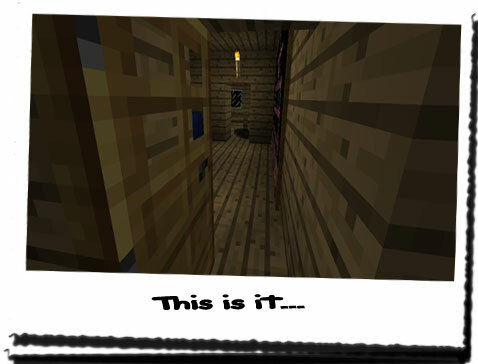 I quickly ducked behind the little alcove that had been made by creating the wooden staircase. This was a nice place to hide; it was sheltered from the elements, and the guards wouldn't be able to see me unless they stood in the greenhouse. I stood there for some time, partially waiting for them to look the opposite way, but mostly trying to guess when it was safe to go back into the mine and try to access the basement again! I waited for a very long time, just to be sure. The sun had begun to set in the Western sky, and I was worried I would be stuck in an awkward place overnight! Eventually I took the risk and went back into the mineshaft. I cautiously made sure no-one was behind me as I joined back with the tunnel, and that no-one was waiting for me up ahead. I couldn't hear any noise, or see anyone, so I took the chance, and silently sprinted for the coiled stairs. The entire time, I was scared that I would run face to face with a guard, or the figure, and just freeze up! 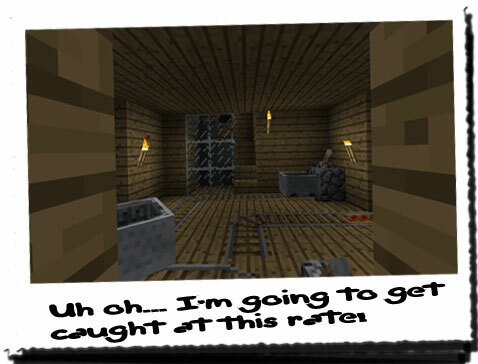 Thankfully I didn't, but I took the precaution of hiding in my treasure room. I hadn't been in here for awhile! I waited a few minutes, listening out for any footsteps from above, but there was nothing. Maybe they had left the house and were searching the perimeter again... I decided to check, and ascended the ladder to the house. I peered through the hatch that hung over the ladder, and when I was sure, I jumped through to the weapons room I had blocked of awhile ago. I hugged the wall, my eyes darting around for any sign of a guard, but there was no-one. Brilliant! I just needed to get up to the bedroom and send the message. If no-one was upstairs, this was going to be so easy! I stopped... I hadn't noticed until it was too late... A shadow had started to creep across the door... It had been silent... I was sure there had been no-one upstairs! From the right, the shadow lengthened. I quietly stood up, and backed towards the balcony door... The wood creaked far too loud for my liking, as I continued onto the porch... What would I do? Where do I go from here? Even if they didn't know I was here, they would read the message... GOD! Why hadn't I locked it!? !